Total end to end solution. Today water utilities & municipal corporation in India are faced with aging infrastructure and negative operating budgets while challenged to meet rising customer demands. 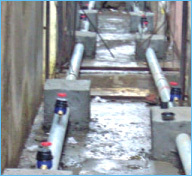 The solution is accurate measurement of water & most importantly with measurement integrity. Chetas is the first company to implement the AMR solution in India to Navi Mumbai Municipal Corporation & Municipal Corporation of Greater Mumbai and inturn provided the automatic revenue cycle to these municipal corporation. The system accurately measure & collect the consumption data to generate a bill without (manual) interference & errors. Regardless of the information needs, whather for a monthly, quarterly billing cycle or daily usage analysis, the flexibility of system allows the municipal corporation to build the optimum system for 24 x 7 distribution network. 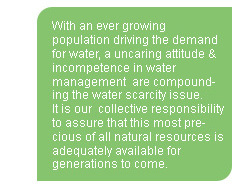 Today's water scenario demands the optimistation of water resources and integrated comprehensive solution to built modern/ real time water management of the city. Centralised monitoring and control to manage multiple facilities from a single location. Remote software administration for engineers and operators for better control. 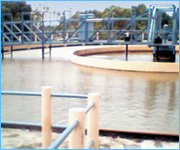 Saving on operation and maintenance of water works & network. GIS Systems for real time data for actual asset management and maintenance application. By conducting a professional water audit for your installation, we help make your business or service as water efficient as possible. We employ the latest equipment and highly effective methods to identify equipment or practices that can be modified to reduce water consumption across your facility or premises. With proven expertise in water auditing of distribution networks and water works, our dedicated team works closely with you throughout the auditing process. After zeroing on the problem areas, we assist you in implementing the findings of the water audit (ie. UFW & NRW) which holds the key for water saving for now and in the future. How efficient is your pump? How do you know whether its operation is economically viable? By accurately computing pump efficiency, our comprehensive energy audits help you obtain precise answers to these questions. Based on our findings, you can make informed electrical energy decisions and implement energy-efficiency strategies. From industries to agricultural consumers to non-residential facilities, our energy audits enable pump users to achieve sustainable energy savings, annually.